Models continue to suggest a significant threat for thunderstorms, strong storms, and severe storms in the Tri-State on Sunday and Sunday night. Since we are still a couple of days out, the exact timing and positioning of this system is still uncertain. 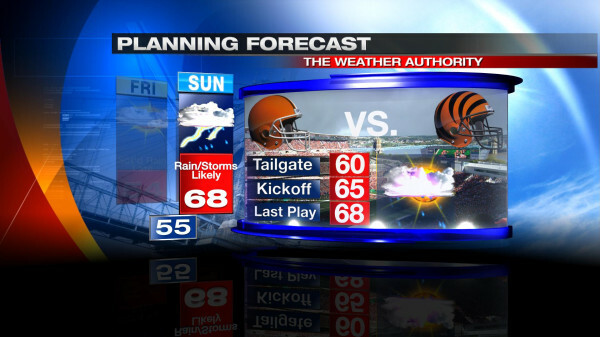 There are, however, a lot of similarities in the weather setup for Sunday compared to Halloween night. 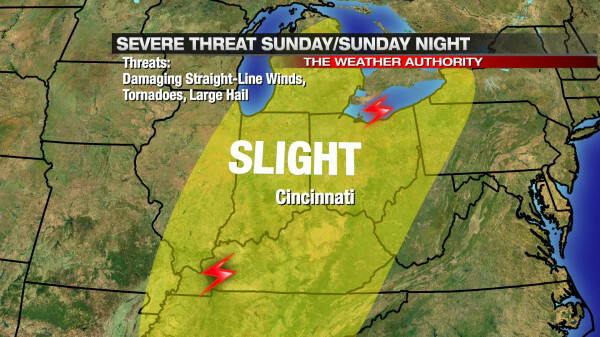 Why are we so concerned about the threat for severe weather this weekend? Simply put, the jet stream is strong, it will be warm, it will be rather humid, and there will be a lot of wind shear (changing of the speed or direction of the wind going away from the ground). Notice how I didn’t highlight instability; in the colder months of the year, severe weather events in the Tri-State often happen with little or no instability. 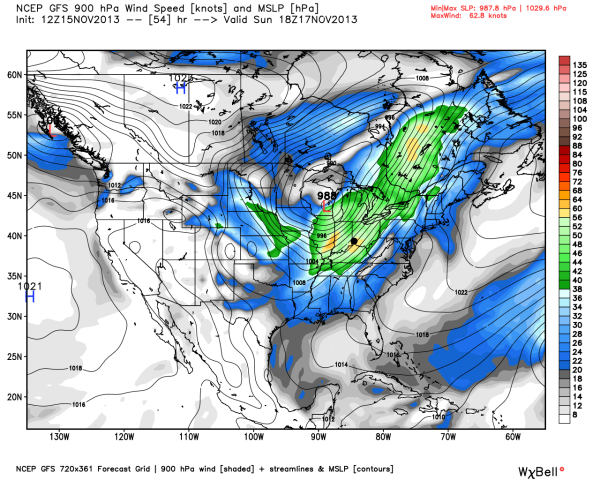 The strength of the jet stream, temperatures, lift, and shear are much more important this time of year. While damaging straight-line winds will be the primary severe weather threat, tornadoes and large hail are still secondary threat with the strongest showers and storms that develop on Sunday and Sunday night. 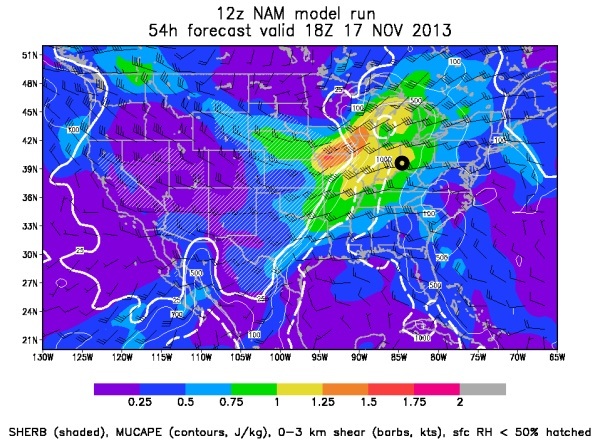 In the forecast model world, there is a consistent signal that that storms will develop to the west and southwest of Cincinnati and move east to northeast with time; this thinking would suggest the main tornado threat will be focused outside of the Tri-State (where storms develop), but – given the amount of wind shear – tornadoes will be possible as showers and storms gradually coalesce into line later in the day and evening. 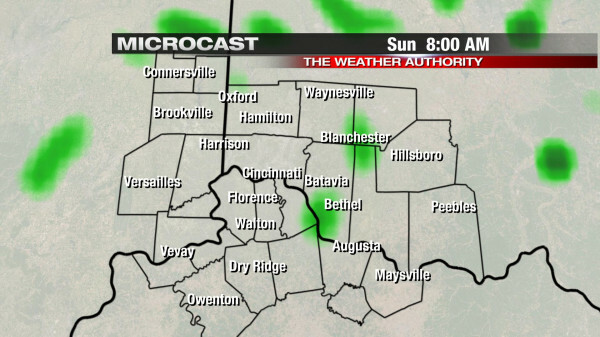 Any sun that we get early Sunday will work against us, increase the amount of instability showers and storms will have to work with Sunday afternoon and evening. In this particular setup, sun and instability is not necessarily needed to get strong and severe storms; any sun we get will only bring up the risk for storms. 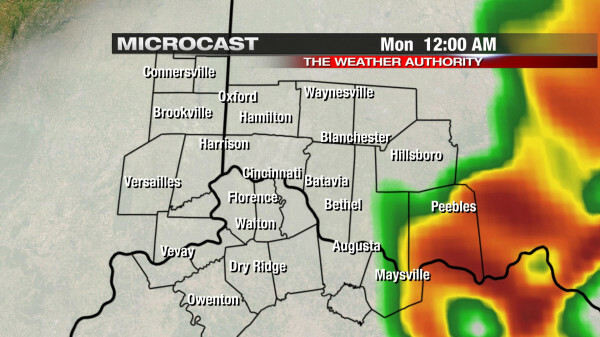 Again, Microcast is just one model. 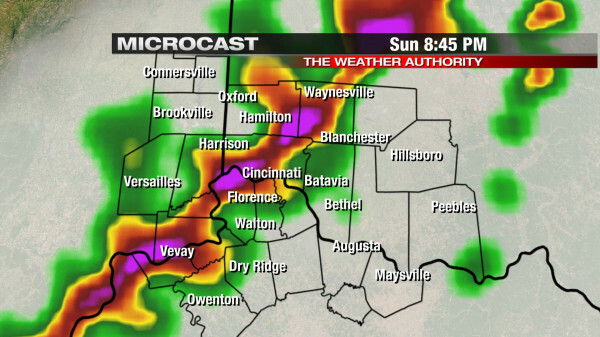 Other models are more aggressive with the chance for storms in the afternoon. Know that – for now – the severe weather window begins in the afternoon and continues through the evening. Winds in green are over 40mph, and winds in yellow are severe (over 58mph). These winds aloft aren’t necessarily what we will see at the ground, but heavy rain and storms will help to bring these winds above the ground down to the Earth’s surface. There are still significant uncertainties about the positioning of the jet stream on Sunday; this is a problem, since the positioning and strength of the jet stream often tells us where the strongest rising motion will be in the atmosphere (and thus the strongest showers and storms). Divergence aloft tends to promote stronger updrafts and, thus, stronger showers and storms. Where their are uncertainties about exactly placement of the jet stream(s), we are in the zone of strong lift, and this means we have more than enough upper-level support for severe weather Sunday and Sunday night. While instability can often have a big influence on the chance for thunderstorms, it isn’t as important this time of the year. If thunderstorms are likely (which they are Sunday), the SHREB parameter or index can be very helpful to a meteorologist in the colder months when looking a threat for severe weather. The SHREB parameter is helpful for getting a handle on a severe weather threat in the colder months because it focuses on temperature changes near the ground, lift in the atmosphere, and wind shear instead of instability (instability tends to be low in the winter even when we get severe weather). The ECMWF and GFS models suggest SHREB values will be lower during Sunday’s event, but still high enough to support severe weather. 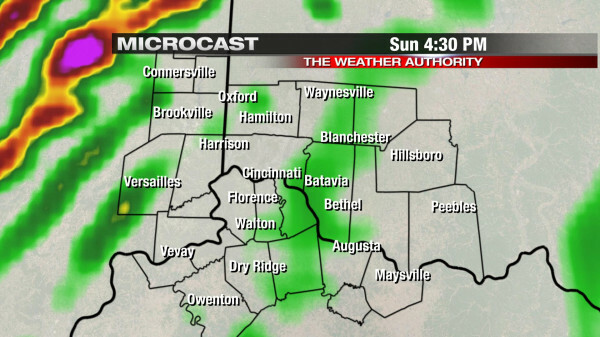 SHREB tells us that instability isn’t really necessarily to get rough storms Sunday. 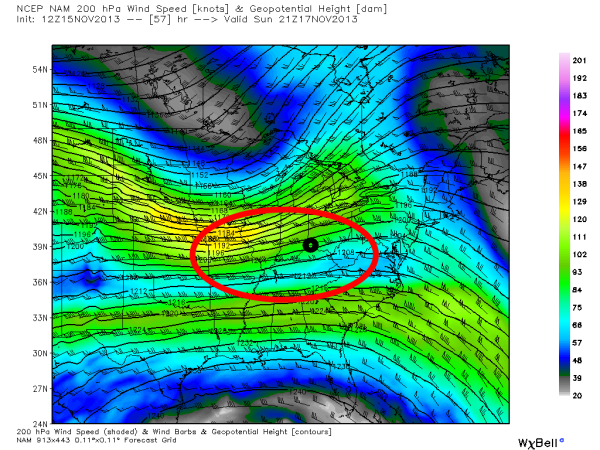 Instability (sunshine) will only aggravate the atmosphere more than it is already primed. The warmth is welcome by most, but don’t write off the wind or chance for storms. Now is the time to prepare! Don’t be caught off guard in the stands or tailgating on Sunday. While the timing and other specifics of this event are still uncertain, the threat for damaging straight-line winds, tornadoes, and large hail are all on play Sunday and Sunday night. I’m working this weekend, and I’ll update you as new model runs complete!